Another masterpiece brought to us all thanks to Pedro & 300discos. 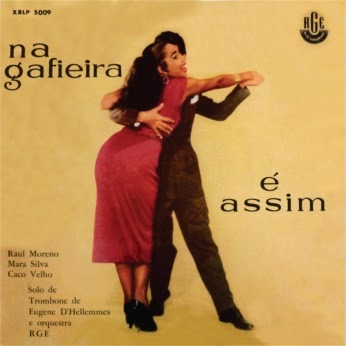 A samba para dançar album from ’58 featuring trombone player Eugène D’Hellemmes, accompanied by the Orquestra RGE with arrangements by Maestro Waldemiro Lemke and vocal soloists Mara Silva, Paul Moreno and Caco Velho. As you might have guessed, the most pleasant surprise of this album are the two songs participation of Mara Silva, whose only career LP, Sucessos em Teleco-Teco is, from my point of view, one of the best samba recordings I have ever heard. Eugène D’Hellemmes was a french trombone and bass player who often recorded in the company of Django Reinhardt in the 1930`s and 1940`s. It is a suprise to see him recording in Brazil in 1958.